It's Crunch Time For The Iranian Nuclear Talks : Parallels Iran and six world powers are meeting this weekend in Vienna with a Monday deadline looming. Here's a look at what it all means for Iran and its neighbors. U.S. Secretary of State John Kerry (right) and Iran's Foreign Minister Javad Zarif (left) shake hands as Oman's Minister for Foreign Affairs Yussef bin Alawi (second from right) and the former EU top diplomat Catherine Ashton watch in Muscat, Oman on Nov. 9. Iran is holding talks with six world powers in Vienna this weekend in advance Monday's deadline for a deal on Iran's nuclear program. 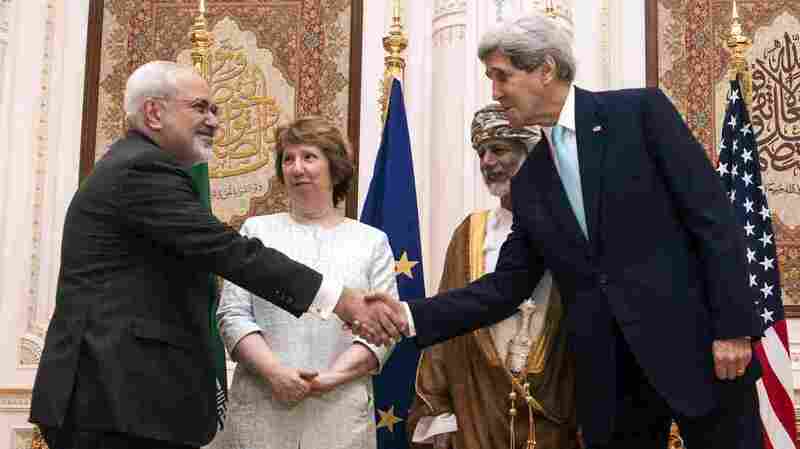 Can Iran and six world powers reach a historic deal over Iran's nuclear program by Monday? The negotiations are at a crucial phase. As the deadline nears, regional hopes and fears are rising in equal measure. A successful nuclear deal to curb Tehran's nuclear ambitions could finally defuse one of the most dangerous crises in the Middle East. But a deal could also lead to more instability as regional powers react to what would be a historic re-set in relations in the Middle East. For many Iranians, a nuclear deal holds out the promise of a better future that could come with the lifting of sanctions. "This is monumental. It opens up the door," says Iranian novelist Amir Cheheltan. He's on a book tour in New York, where his critically acclaimed fiction has more fans than in Tehran. Iranian authorities have censored most of his work. His novels, short stories and movie scripts describe everyday life in the Islamic Republic. His ninth novel, Tehran, Revolution Street, centers on power and corruption in post-revolution Iran. "We have always had this struggle between modernity and tradition," he explains. "The villages are the homeland of religious conservatism, and the cities are the homeland of the middle class. "The 1979 revolution changed the historic equation," he says, empowering Iran's religious conservatives, favoring tradition over modernity. Cheheltan says a successful nuclear deal can fuel another internal transformation. He has witnessed the damage to the middle class from crippling international economic sanctions. He believes a nuclear deal, with the lifting of sanctions, can unleash Iran's dynamic educated middle class. "Definitely, there's a good chance for Iran to advance economically and the urbanized middle class will benefit," says Goudarz Eghtedari, a dual U.S.-Iranian national. 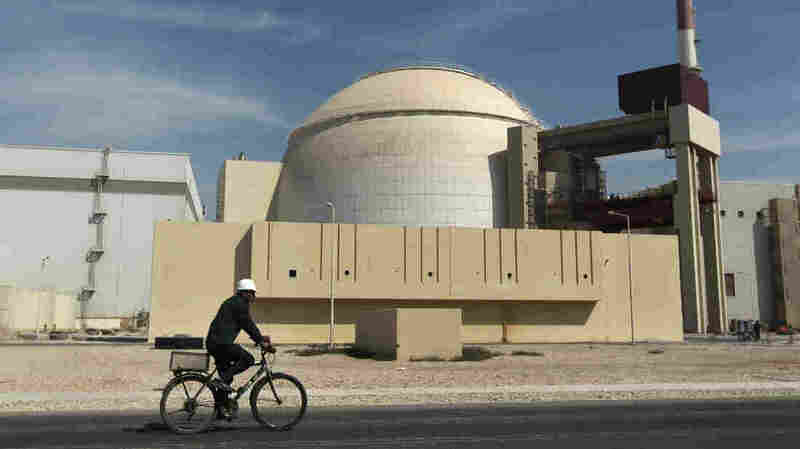 A worker rides a bicycle in front of the reactor building of the Bushehr nuclear power plant, just outside the southern city of Bushehr, Iran, in a 2010 photo. Eghtedari lived in Portland, Oregon, for decades and recently relocated to the United Arab Emirates for a job in engineering. His new home is less than an hour's flight from Tehran; close enough to easily pick up Iranian media broadcasts. "They all speak about high hopes," he says, noting that includes even some of the conservative outlets. Analysts say Ayatollah Ali Khamenei, Iran's supreme leader and the country's chief decision maker, has kept Iran's hardliners in check to prevent them from scuttling the deal. The details of the negotiations remain secret. Iran and the P5 +1 (the members of the U.N. Security Council, plus Germany) began meetings in Vienna earlier this week aimed at meeting Monday's deadline. Officials involved in the negotiations insist a comprehensive agreement is possible as they race against the diplomatic clock. But prospects of a deal have only increased anxiety in Saudi Arabia, Iran's regional rival. The two nations stand on opposite sides in regional conflicts from Syria to Bahrain and Yemen. "The Saudis are worried it will lead to the Americans letting the Iranians get away with whatever they are doing in the region," says Jamal Khashoggi, a U.S.-educated Saudi journalist and editor-in-chief of Al Arab News Channel. The Saudis see an Iran that is dominant in Lebanon and Iraq and forcefully propping up a long-time ally, President Bashar Assad, in Syria. In the Saudi view, a successful nuclear deal would give the Iranians another step up the ladder to regional dominance. After decades of U.S.-Iranian enmity, open channels of communication between Washington and Tehran now unsettle the Saudis. "Many are worried," explains Khashoggi, because they believe it a choice between them or us. "The Americans can only take one wife," he says, describing alliances in the region. But he believes this thinking is wrong. "We Saudis need to look differently. The Iran of the 1980s is disappearing." Saudis don't see Iran's "huge transformation." he adds. "They don't want to believe there is a strong middle class." Saudi Arabia's official anxiety is likely to become more pronounced, certainly in the short run, says Andrew Tabler, of the Washington Institute for Near East Policy, "Especially after more than three years of bloody conflict in Syria, where Sunni powers (like Saudi Arabia) see an existential conflict." The Obama administration continues to reassure Saudi Arabia that the U.S. is committed to Saudi security. But a deal with Iran could undermine Saudi and Gulf state support for the U.S. led-coalition against the Sunni radicals of the Islamic State in Syria and Iraq. "A nuclear deal further complicated the task of holding the (anti-Islamic State) coalition together" in Syria, says Brian Katulis with the Center for American Progress. The Sunni powers "deeply distrust Iran, a nuclear deal doesn't wash any of that distrust away." Inside Syria, activists are also closely watching the outcome of the Iranian negotiations. They see a win for Iran is a loss for them. "Obviously, for us, Iran is an enemy just like Assad," says activist Raed Fares, who heads the media office in Kafranbel, a rebel-controlled town in northern Syria. "The struggles of the Syrian people will last longer if the sanctions are lifted" and Iran can freely send cash and military advisers to support the Syrian regime. The Obama administration has made the success of the nuclear talks a priority, a chance to reset relations in the region. Success or failure will have a significant impact. "My sense is that Iran is on the verge of a major transformation," says Mohsen Milani, after a recent trip to Tehran. Milani is the executive director of the Center for Strategic and Diplomatic Studies at the University of South Florida. "The leaders, that brought us the revolution, are in their late 70s to 80s," he says, noting that the majority of Iran's population was born after the 1979 Islamic revolution. "We are at the beginning of a new generation. You talk to ordinary people and you see a very dynamic and mature society," he says, more interested in the stock market than the mosque. But to get to a deal, both sides have to make tough choices and the clock is ticking. Hiba Dlewati contributed to this report.